Jim Crago was born in Wabash, Indiana and spent his childhood in Ohio and Pennsylvania before his family moved to southern California. He graduated from High School in the little town of LaVerne, CA in 1967. He left California to start his college education in McPherson , Kansas. Like many students his interests changed several times over the next few years ranging from music, Industrial Arts, Forestry and then Animal Science. He attended McPherson College, Northern Arizona State University and then Michigan State University in East Lansing, Michigan. Once he set his mind of entering Veterinary School, all his efforts were focused on obtaining that goal. He first obtained a Bachelor of Science degree in Animal Husbandry in 1973. 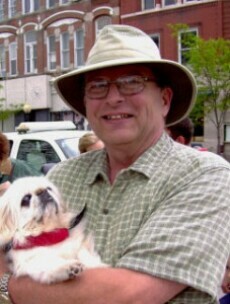 He entered the Veterinary School immediately following graduation and graduated from the College of Veterinary Medicine in June of 1976 with his Doctor of Veterinary Medicine degree. He practiced for a year in Orange City, Iowa in a mostly large animal practice caring for cattle and hogs while gaining much experience. Dr. Crago then bought a mixed animal practice in West Point, Iowa where he became very active in the community. During this time he served on the City Council, both as a councilman and mayor. He joined the volunteer fire department and worked as a certified paramedic in the evenings and weekends. Currently he is a member of the American Veterinary Medical Association, the East Central Missouri Veterinary Medical Association, the Jefferson City Chamber of Commerce and attends the First Christian Church. A career change was in store for him which allowed him to work as a Veterinary Medical officer with the Food Safety Inspection Service for a little over 5 years. Most of the time was spent in northern Iowa or Minnesota in numerous meat packing facilities. The desire to return to private practice led him to his present ownership of the Crago Veterinary Clinic here in Jefferson City. He has been busy with operating the business since May 1999. He loves seeing and taking care of his many patients and getting to know their owners. He has been married for almost 22 years to his wonderful wife Melba. Together they have a total of 5 children and 12 grandchildren. “Life is so very awesome when it comes to our family. We enjoy getting together with them, going out to eat, and spending time with our friends at church. As many already know, in Oct, 2010, Melba was diagnosed with Stage 4 Lung Cancer. She is doing very well with the chemotherapy treatments and we are grateful for her continued progress. The support and prayers we receive from all of our friends, family and clients is greatly appreciated”. For the past 6-7 years Dr. Crago has pursued his interest in Radio controlled Helicopters with a great amount of enthusiasm. It gives him the opportunity to get away from it all and enjoy being outdoors doing something he loves. With working five and half days a week year round, time is precious. He spends it working in his yard, his work shop and flying every chance he can. Bonnie is a native of Omaha, Nebraska. She received her Associate Degree in Animal Science at Omaha College of Health Careers. She continued her career in various research departments at the University of Nebraska Medical Center, including being part of the Liver Transplant Team. She moved to Jefferson City in 1995 at which time she became a member of the staff here in our veterinary practice. She has extensive medical experience in a variety of different areas within veterinary medicine including: emergency care, critical and intensive care, assisting as a Surgical nurse/assistant and monitoring the patients’ anesthesia during and after any procedure. Her duties include caring for our patients and administering any necessary treatments and procedures needed while here in the hospital. She provides a lot of information to our clients about their pet’s needs and is a great asset to our hospital and staff. She is married to John and they have three children, Shemaine, Elizabeth, and Jack. Her interest in animals and their welfare has expanded her family to include rescues. She has a bulldog named Ug, a Sulfur-Crested Cockatoo named Charmain and a Bearded Dragon named Max. She is not only attentive to her family and career, but is a leader in the community, where she is an Assistant District Commissioner for the Boy Scouts of America. Lesa has lived and grown up in and around the Jefferson City area most of her life. She has had numerous working experiences before joining us here at Crago Veterinary Clinic. Her love of all animals is easily recognized when talking on the phone or when they come through that front door. She is a cheerful person to get to know and enjoys meeting every pet and their owner. She and her husband Larry, live west of town with their two sons along with many furry pets. They have dogs, cats, a Macaw and Finches among the menagerie. We are excited to introduce our newest addition to our Hospital. Sherri Steen will be our groomer and comes to us with over eight years of grooming experience. She started March 5th, 2013 and will be taking appointments each week on Tuesday, Wednesday and Thursday. Sherri lives with her husband Russell in Linn and they together have 6 children and 9 grandchildren. If that isn’t enough, they have 9 dogs and a cat to care for also. Sherri was born in Kansas City and has lived in Phoenix, Idaho, Wyoming and Utah before settling here in mid Missouri. She has extensive experience doing graphic design and printing in several businesses around this area. She spent 8 years working and grooming pets before coming to our hospital. We welcome her and are happy to introduce her to our clients and their pets. Call and make an appointment to have your furry friend cleaned and groomed today. Dr. Dozier has been a long time resident of Jefferson City where he started and established the Southwest Animal Hospital in 1971. Throughout his many years of practice, he developed a strong interest in orthopedic surgery. He is a member of the Veterinary Orthopedic Society, the American Dental Society, the American Veterinary Medical Association and past President of the Missouri Veterinary Medical Association. Dr. Dozier performs some of the advanced surgical procedures when his skills are needed. We are fortunate to have him available to all of our patients at their time of need.